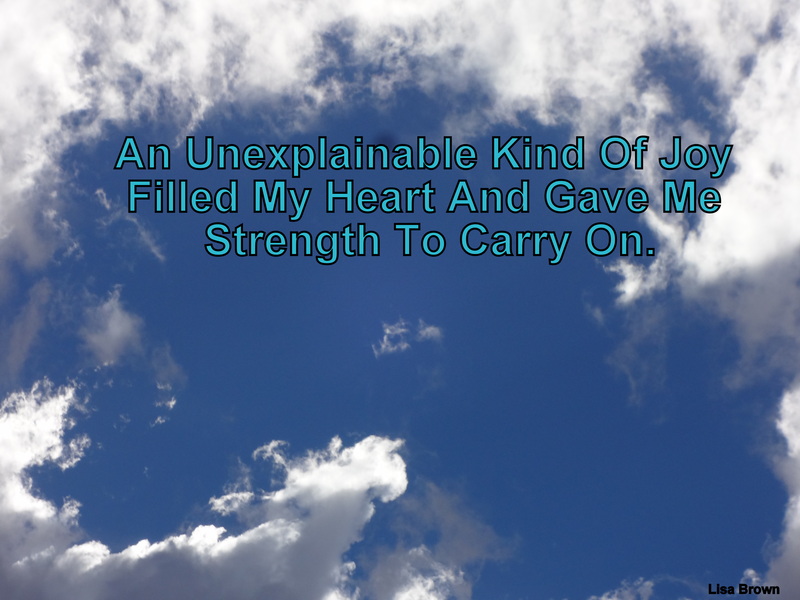 This morning I felt an unexplainable kind of joy. It was a feeling that goes deeper then happiness and contentment. It came as a surprise and at the most unexpected time. I was washing dishes and making meat loaf with my five year old daughter. I just received a phone call from my husband that he and my son were heading home from Boy Scout camp. They had a great time and I felt a sense of relief. Nothing grand going on. So I thought. I stopped for a moment to take in this feeling and praise filled my head. I begin to experience flashes of key moments between my daughter and I over the weekend. Sweet moments that will be in both of our memory banks forever. We connected in a mighty way. God whispered in my ear that He was pleased with me that I had spent the weekend putting my daughter first. Peace and Joy was the fruit of my love. I been struggling with health issues and anxiety. I been feeling weak and tired from worry. God came to my rescue and strengthened me with His joy. In preparation for our weekend without the boys, we bought red roses for our table, soap that smells wonderful, and a chocolate candy bar. We delighted ourselves in laughter and the anticipation of an enjoyable weekend brought us closer together. This warmed my heart and gave me strength to push through the anxious thoughts I was struggling with. I gave my worries to God and focused on the now. On our first night alone we decorated a jewelry box and made jewelry. Together our hearts danced! I got lost in the moment and all my cares disappeared. Together we giggled as we chased each other through the house playing tag and hiding go seek. We had a sleep over in my bed and breakfast in bed. Life couldn’t get any better than this. For a time, I was able to forget about all the house work that didn’t get done because my migraine headache had slowed me down. I relaxed and let the laughter in my heart come out. What is this kind of joy that came from heaven above? It’s refreshing and renewed my tired soul. It moved me like the sunshine does through my window in the mornings. I believe joy comes like this when we live life with love and laughter. Joy inside of us becomes obvious when we give God our concerns. Joy overtakes us when we live in grace. We are covered in joy when we obey God and keep our priorities straight. How true, “Joy overtakes us when we live in grace.” This is beautiful, Lisa! What a precious experience you had with your daughter! My Lisa, this lovely post made me have happy tears for you. I can just picture you and little Kaylee having so much fun together. I am truly happy for you that you were able to find such peace and joy this weekend….. I’m looking forward to hearing all about Justin’s big camp out with his daddy! Aw, this is so sweet! What a great time to be rejoicing over! : ) Thanks for sharing this story and reminder! Thank you for coming by!!! I’m glad you enjoyed. It’s always fun sharing stories with others!! Amen, friend! Love and laughter is where it’s at! Sounds like a super fun time. What precious memories!